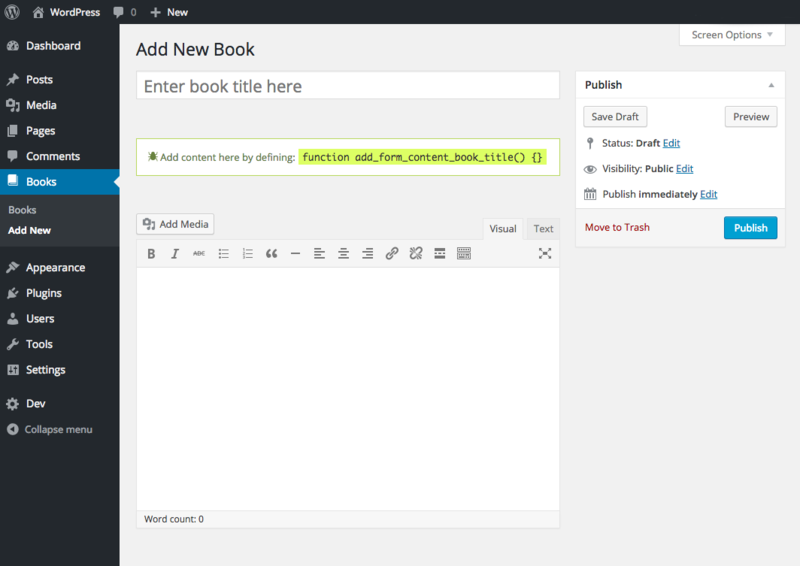 The post type API lets you extends the types of content available in WordPress. Each type of content, or “post type”, should have a single responsibility. For example, “Post” and “Page” are post types built into WordPress and have separate responsibilities. “Post” is singly responsible for blog posts and “Page” for standard web pages. For terminologies sake you “register” a “post type” when you want to add a new type of content. With TypeRocket you add post types without having to understand the inner-workings of WordPress. Let's assign the “Book” post type to a variable to see these features. There are 4 place to add custom content within the <form> element for each post type. You can open up these sections with 4 different methods: setTitleFrom() for after the title, setTopFrom() for before the title, setBottomFrom() for the very bottom and setEditorFrom() for after the editor.